Currently, Omicron Delta Epsilon has 678 chapters located in the United States, Canada, Australia, the United Kingdom, Mexico, Puerto Rico, South Africa, Egypt, France, Kazakhstan, and United Arab Emirates. With such a broad, international base, chapter activities vary widely, ranging from invited speakers, group discussions, dinners, meetings, etc., to special projects such as review sessions and tutoring for students in economics. 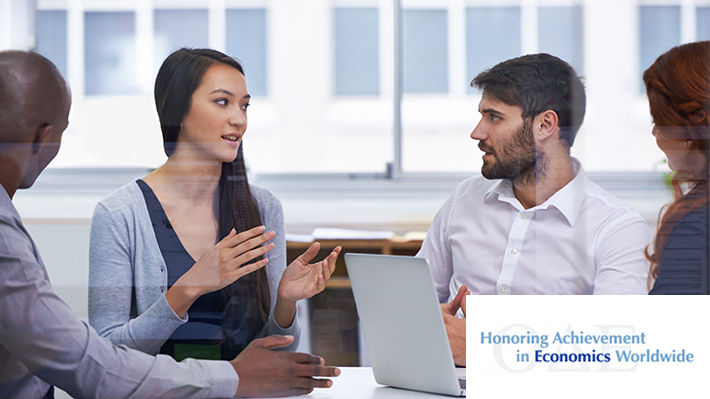 At the LeBow College of Business, ODE works very closely with the Drexel Economics Society (DES). One-year subscription to The American Economist. Must be in one of the following programs: BS in Economics, BA in Economics or BS in Business Administration with a concentration in Economics. During the spring term, the School of Economics collects the data on grades and earned credit hours in ECON courses (including winter term grades) and finds the students who meet the eligibility requirements. Then, it applies to ODE on behalf of the students and pays the lifetime membership fee. We get the certificates from ODE and induct that year’s members at an annual ODE luncheon held in the first or second week of June.